When last week they played in Copenhagen, the reports from fans were poor to middling — basically they brought their well-known, little rehearsed, anarchic 10-odd dudes yelling on stage-approach to performing, which is good and well when it works, but less so when half of them aren’t up for it. 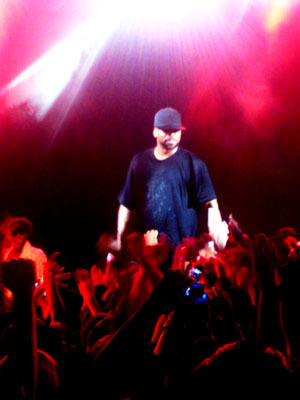 The London show had one major advantage on the Copenhagen one, though: Method Man. Last week, he cancelled at the last minute, but here he was very much present, acting the natural centre of the proceedings and really giving it his all. Clear on the mic, charismatic and seemingly happy to be on stage, he made the concert. As expected, Inspektah Deck and Raekwon gave solid performances, even if they at times lapsed into yelling rather than flowing, and RZA, who is obviously the fabric that today — barely — holds together the increasingly disparate Clan members, was an enthusiastic and clear focal point. As for the rest? Er… Master Killer was fine when performing, but we didn’t see much of him, Capadonna mostly acted the hype man, and U-God and GZA were straight-up wack. Most of the time, you couldn’t hear their raps — and as much as I’d like to blame the generally weak sound on the mics, this was just much a case of weak voice control. There was also a good deal of adlibbing, not just of each other but of themselves, instead of *actually rapping* whole verses, which is kind of pathetic when you consider that these guys have been performing for two decades. And Ghost? Well, the current breakout star and most talented MC of the bunch didn’t do much. He stepped to the mic for at most half a dozen verses, and he was OK, but the rest of the time he stood around looking alternately bored and disgusted. He even copped out on a number of songs on which he has verses! His disagreements with RZA over the creative direction of the new album and over old royalty payments are well-known to those that follow that kind of thing, but that’s no excuse to act like a prick on stage. This kind of behaviour is just appallingly unprofessional. Granted, from my experience of his live shows — and I’ve seen him perform solo for a big audience in New York — he is never particularly on point, but he could surely have done better for the paying fans than this. It was obvious that the Clan to a large extent survives this kind of gig on the strength of their material and status in hip hop history. The set consisted largely of joints from their classic debut Enter the 36 Chambers (1993), with a sampling of material from Forever (1997) and The W (2000), as well as a handful of songs from their solo joints (though none from Ghost’s, predictably). But nothing — I repeat NOTHING — from their new, largely brilliant album. As mentioned, we know that Ghost and Rae are unhappy with it, and one couldn’t help speculating that downplaying it was a condition of them even going on tour. That’s entirely idle and baseless on my part, and I know they at least attempted a half-assed rendition of the single “The Heart Gently Weeps”, where Rae forgot his verse, in Copenhagen, but still. So, RZA, Raekwon, Deck, and especially Meth, made this an occasionally great show, but overall the Clan did not do its reputation justice on this one, even if it was consistently entertaining. Disorder and discord within their ranks aside, the lack of professionalism and often lethargic attitude of several of the members, as well as Ghost’s arrogance, made the feeling hard to shake, that this was a less-than-stellar swan song for a legendary collective, who recently defied everyone’s expectations with a great comeback album. I hope I’m wrong. Photo: They made the night: Meth on the barrier, RZA on the left.